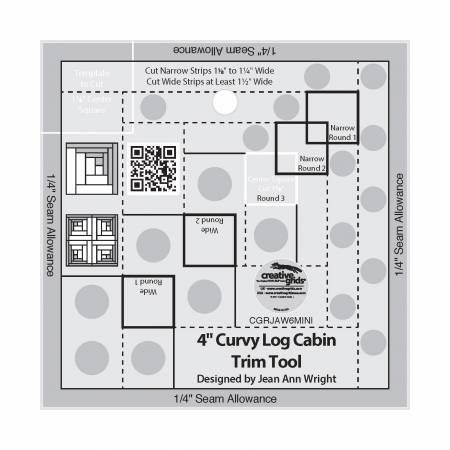 Create the illusion of curves with this 4" version of our popular Curvy Log Cabin Trim Tool. Sew four blocks together to, piece a circle which finishes to 8". Combine these blocks with other 4" blocks for unlimited design possibilities. The tool features easy-to-read black and white markings and the popular Creative Grids® grip. The ruler slides easily over the fabric until pressure is applied; then, our exclusive gripper holds the fabric in place while cutting, eliminating slipping and miss-cuts! Creative Grids Rulers have a MAP (Minimum Advertised Pricing) Policy. Please do not advertise them for less than the suggested retail.